As I have mentioned, I am fascinated by my military ancestors. I enjoy tracking their service and have found ancestors that have participated in every major U.S. conflict. Except for World War I, that is. I have always been fascinated by that conflict, one that I felt was glossed over in the classroom. I never knew much about World War I, outside of my basic school-room knowledge, until I was able to visit the National World War I Museum in Kansas City, Missouri. The museum was designated by Congress as the nation's official World War I museum and re-opened in 2006 after having been totally redesigned. That visit inspired me to learn more about the war and I have since read books, novels, websites and more to understand the conflict better. As a part of that desire, I hoped to find a relative that participated in World War I. No ancestors from my direct line participated in the War. I did find an ancestor on my husband's side that was enlisted during that time: Frank Herman Roelker. Frank did go overseas, but did not get to the conflict until after November 1918. So the next option was to look into distant relatives. 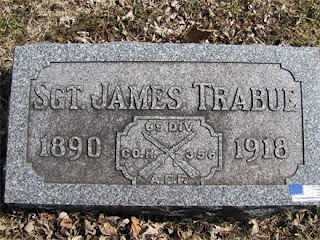 I finally found one on my father's side: James Smith Trabue. James was a very distant cousin by marriage and I stumbled across his WWI service quite by accident. I had received information on my Burnett family line written by Estella George Trabue. Estella had long since passed, but I was interested in knowing more about this family historian, a kindred spirit. 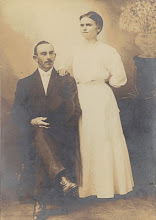 Estella married James Smith Trabue in 1911. As I do with all ancestors, I went to Findagrave.com to see if I could locate their death information. 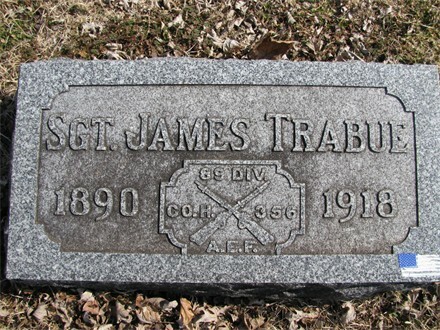 I found SGT James Smith Trabue's headstone, which indicated that he had served in Company H, 356th Regiment, 89th Infantry Division, American Expeditionary Forces. The dates on James' headstone were 1890 to 1918. Did James die in combat? James was buried in Missouri, so I decided to visit the Missouri State Archive's Digital History website and search their military records. What I found was astounding to me: James enlisted in September 1917 and served overseas from 4 June 1918 until 11 November 1918...the day he was killed in action. My relative, however distant, was killed on the final day of the conflict. I was now on a conquest to find out more about James Trabue. My next step was to visit the National Archives website and place a request for his service record. Because I was not a direct descendant from James I had to fill out Standard Form 180 to request his file. I made a copy of the document and then mailed it on 10 March 2010. I had to wait a very long time for a response, and when it finally came on 18 October 2010 it was not good news. "Dear Sir or Madam: The record needed to answer your inquiry is not in our files. If the record were here on July 12, 1973, it would have been in the area that suffered the most damage in the fire on that date and may have been destroyed." The letter goes on to suggest that there may be a "casualty file" maintained by the Department of the Army and they gave contact information for the U.S. Army Human Resources Command. I sent the specific department mentioned an email, but never received a response. But I have not given up. I will continue to look for information on James Trabue. 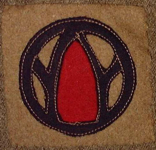 I can't possibly quit looking for the story of James because not only am I kindred spirit of his genealogist wife, but I am also a military sister: I served with the 89th Infantry Division's descendant, the 89th Regional Readiness Command, as my first unit in my military career. Just catching up with your blog - great stuff! Debi- thank you! Yes, I was pretty bummed about not getting his records. My grandfather's records were also lost in the fire so I have limited knowledge of his service. But I have learned quite a bit about their service through studying the units they were assigned to. That has filled some gaps, but nothing like their records would have.